In our house the whole family is primal, including the cats! They eat paleo food, which is called BARF (Biologically Appropriate Raw Food). It is something that works for all domestic animals since its basically food that imitates their natural diet. Just like paleo food are for humans. Ideally the cats would eat whole food, like chicken wings and other things that includes bone, skin and also preferably organ meat. Cats need to get all the different amino acids, especially taurine that is only available in the heart muscle. I’m sure cats are able to eat a diet based on real animal parts if they get used to it from when they are kittens. The cats are extremely picky so its hard to learn them to eat new things when they’re old. Our Olivia seems to enjoy the taste from bones but her gut can’t handle them so she throws them up directly. But, I was able to find bone meal of good quality that both Olivia and Neo really enjoy, which is a really good alternative to whole bones. It’s a bit sad though that they don’t get to use their jaws properly. Whats’s wrong with cat food from the store? To give cats grain based dried food will cause inflammation, digestion problems and dehydration. Cats are desert animals from the start and obtain almost all their water from the food they eat meaning that dried cat food will lead to kidney failure and different problems with the urinary tracks. Before Neo came to us, he was sick all the time due to these metabolic issues. It’s also very common for cats to have diabetes. The wet, canned cat food is a bit better since it won’t lead to dehydration but it still often contains the inflammatory grain and sugar. Also, you have no idea where the meat comes from. We want to know 100 % what we give our cats to eat, just like we want to know what we eat ourselves. Olivia approves the ingredients for this BARF batch. She found her favorite, the chicken liver. First, as I mentioned, it is a bit tricky to get the cats to change from their grain based cat food that they’re used to into BARF since the taste and texture is completely different. It has been a struggle for a year now and its finally starting to ease. Olivia is fine with most things while Neo needs to be convinced over a long period of time to every new taste or texture. It is also a bit tricky to find all the parts needed to give a proper BARF diet, but it’s possible! Just a bit more time consuming compared to buying the cat food from the store. The most important thing is that all the food is raw. Cooked bones are extremely dangerous since they will hurt the stomach by breaking into bits while raw bones have a different texture that isn’t causing splitters. Also, cooked meat contains anti-nutrients for the cats that will cause inflammation. On the other hand, if you choose to give some vegetables (eg. to imitate what’s inside a mouse stomach) you need to break the cellulose first either by steam cooking or freezing. 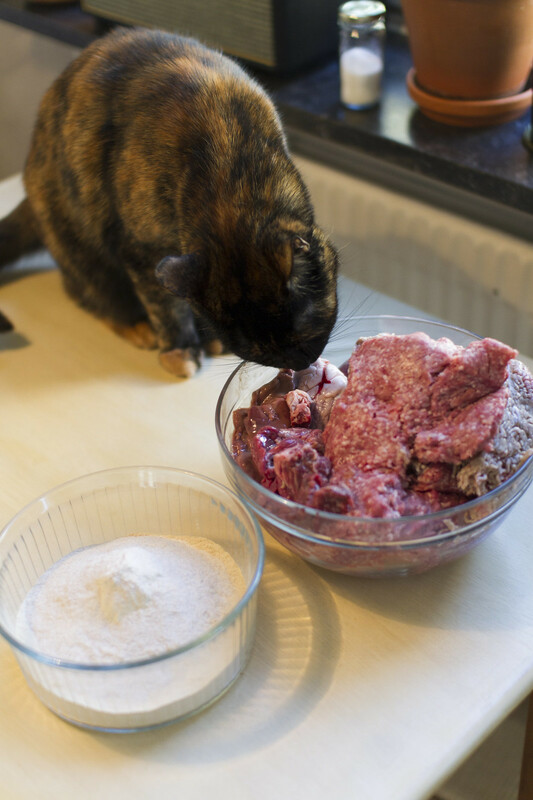 Make sure to handle raw meat responsibly even though it’a unlikely that the cats would eat bad food. Their gastric acid is very powerful and will kill all the bad bacteria off.